We receive lots of hot sauce samples. Most of them are fine, but not special. 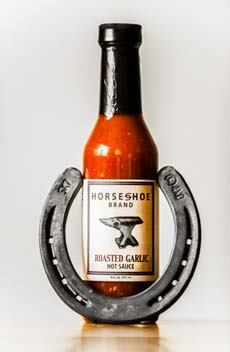 Enter the special: Horseshoe Brand hot sauce, developed by two entrepreneurs in New York State’s food mecca, the Hudson Valley. Why? The hot sauces are made from scratch using fresh chiles. Many hot sauces use extracts that provide heat, but not flavor. Macerating fresh chiles provides a lively, fresh-tasting hot sauce that is a delight. One of six delicious flavors; horseshoe not included (photo courtesy Horsehoe Brands). At $5.99 a bottle, they’re affordable stocking stuffers, party favors. Head to HorsehoeBrand.com and load up!